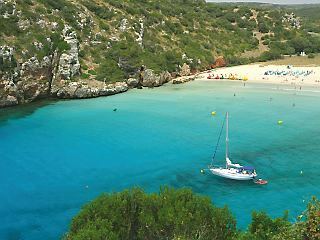 Beautiful Menorca, also known as Minorca, is an island that is found in the Mediterranean Sea off the side of Spain. The name is derived from a bigger island which borders it and which has the name Marjoca. For anyone who loves adventure, site seeing and going for picnics, this is just the place to be. The environment is serene and leaves one with lasting memories. There are also many historical wonders to learn about from this island, with the caves, coastlines and beautiful towns. Some of the top 5 sights of Menorca are the Cales Coves, Xoriguer Distillery, Los Delfines Aquapark, S’Albufera des Grau and the Mahon. The Cales Coves are a series of caves that are just a few kilometers away from the main town on Menorca. The caves are said to contain some buried treasures of the ancient people. This site would definitely make for an adventurous outing for kids especially when they are told to look for these treasures with the promise of a great reward. Well, the possibility of there being any treasure by now is almost nil, but who knows? The adventure is even more interesting because there are no maps or tour guides to provide directions. What an exciting way to explore an unfamiliar territory! The Xoriguer Distillery is a difficult name to remember, but it is worth noting that it is one of the top 5 sights of Menorca that one cannot afford not to miss while on holiday here. The food and the drink, compounded with activities of brewing gin, all form an experience that makes one forget about going back home, especially if one has a love affair with the fermented drink! Los Delfines Aqua park is yet another place to visit, with more exciting features to enjoy than its counterparts. In other words, people who love swimming will enjoy having good moment in the water features like the Black Hole, The Giant Toboggan, The Hydro-tubes and most interestingly, the Adventure River. Anyone interested in flora and fauna? Then S’Albufera des Grau is just the place for you. This is a nature reserve that has millions of specimen to observe as you enjoy the peaceful, relaxed atmosphere. Birds, with their different and varied chirping sounds, are in plenty and anyone with a keen eye for detail will notice over eighty different species of birds. However, their availability depends on the season, so make your timing right. If you thought Menorca is a deserted Island, think again. It might be small, but is full of life. Mahon, the fifth place on our top 5 list. It is not only the heart of the island, but it is also the capital. The city is home to historic museums and buildings, has restaurants which serve local cuisine and are full of life, culture, excitement and lots of fun. Any of these sites will make the visit to Menorca truly one to remember for life.